Over the last few years I have created fun, themed birthday parties for my kids such as last year’s dragon party. The result of this creativity is now my children are requesting elaborate themes. This year both kids wanted an animal themed party, even going so far as to suggest that I make individualized animal costumes for each party guest. That requested netted a swift no, but I did want to try to make their cake ideas happen. My son requested a cake that looked like a monkey hanging upside down. 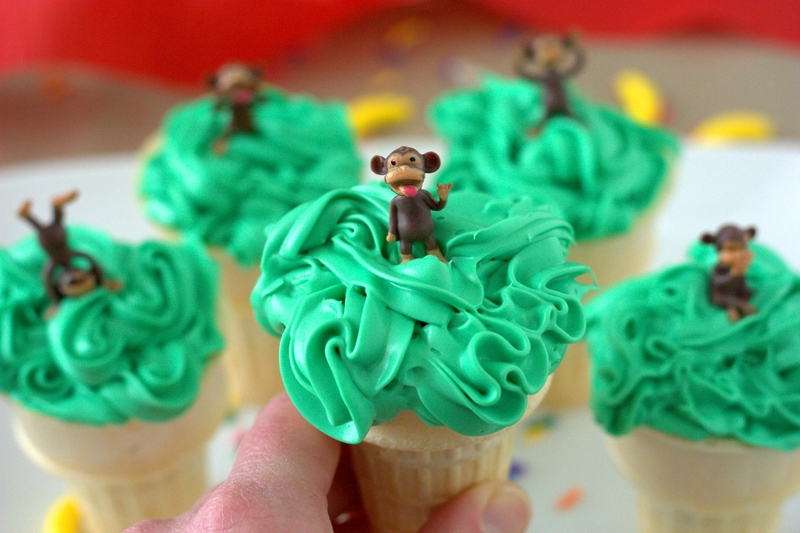 This sounds like a lot of shaping and cutting of round cakes so I decided to make these Monkey Tree Cupcakes instead as a play on the monkey theme. 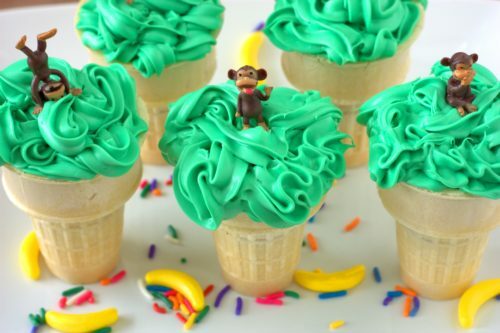 I filled cake cones with a couple mini cupcakes, frosted the top with green frosting to look like a tree, and then affixed miniature monkey figurines. Cute right? My son thought these were great, and I loved the minimal effort. While many ice cream cone cupcake recipes call for baking the cake in the cones, I didn’t want too many cone cupcakes (preferring to use the remainder of the batter for a 9-inch round cake) and others have commented on soggy cones. If you do decide to try these by baking the cake in the cones I’d love to hear how then turned out! Preheat oven per cake mix directions, then mix cake mix per directions. Line 24 mini cupcake forms with liners (this requires only ~1/3 of the batter; see note below for use of remainder of batter). Pour batter half way up the mini cake pans, then bake for 10-12 minutes or until a toothpick comes out clean. Remove from oven and let cool completely. To color frosting, place frosting in a bowl, and then stir in food dye. Place frosting in an icing bag affixed with your favorite tip (or use a gallon sized freezer bag). 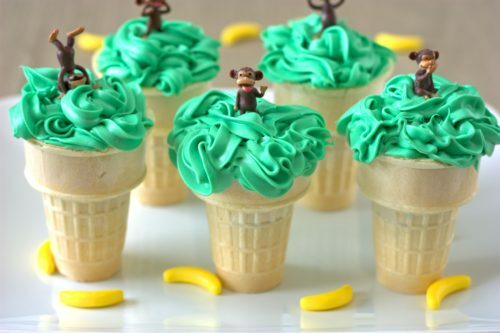 To make the Monkey Tree Cupcakes, remove the mini cupcakes from the wrappers and place two inside each cake cone. 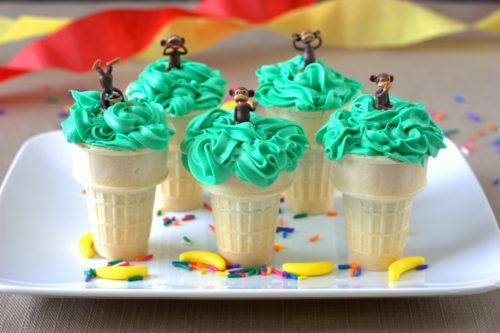 Swirl the frosting on top of each cake cone to make “tree top” and then gently place a monkey on top. Note: 1 box of cake mix will typically make two 9-inch round cakes, 24 cupcakes, or 72 mini cupcakes. For my preparation of this recipe I made 36 mini cupcakes, and one 9-inch round cake. This entry was posted in Dessert, Party.